California's allure has always been hard to resist. Boasting a rich musical history, the state has always been known to adopt a healthy number of talented transplants like Gram Parsons and Neil Young, and embrace them as its own native sons. The success of these transplants over the years has only further augmented California's implicit promise of artistic prosperity and the actualization of one's artistic dreams. To Simon Petty, singer-songwriter and acoustic guitarist of MINIBAR, who, along with his band relocated from London to Los Angeles three years ago, California just seemed to be the place where things happened. "I've always thought about California," Petty says from his home in Santa Monica, "the way us English people perceive it: golden, and full of opportunity." Formed in London in the mid-'90s by Petty, Sid Jordan (bass, vocals) and Tim Walker (electric guitar, vocals, pedal steel), the band was completed by fellow-Londoner Malcolm Cross (drums, vocals, percussion) and relocated to L.A. 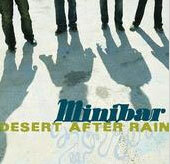 Soon MINIBAR was signed and recording its debut album with producer T Bone Burnett (O Brother, Where Art Thou? ), the critically-lauded Road Movies. "Lyrically," Petty says "it was the idealized version of America in general and specifically L.A."
While Road Movies was written with the wide-eyed vision of a newcomer, Fly Below The Radar, produced by Dusty Wakeman (Lucinda Williams, Rosie Flores, Jim Lauderdale) and Rami Jaffee and Greg Richling of The Wallflowers, follows up with a stellar leap both musically and lyrically. Recorded with a DIY ethic and complete autonomy, the band completed the album and secured a licensing deal with Foodchain Records. Even the artwork was a hands-on effort by the band, with the cover art created by Cross. Filled with soaring rootsy grace and timeless West Coast style harmonies, the new album effortlessly captures the beauty and darkness of the jagged Californian landscape. The graceful beauty of "Unstoppable" is an elegant invocation into Petty's seemingly lonely world ("I've been alone for so long/Sometimes I don't know what to say"). The dusty slow-country shuffle of "New Mexico" contemplates "enforced distance and the romantic luxury of missing someone" says Petty, whilst the driving title track, whose infectious chorus ("Fly Below The Radar/Crash into my room/Love me hard without hurting") is accentuated by Petty's trademark husky vocals. Fly Below The Radar is a melodically mesmerizing album about life, love, and loss, and the distance between people sometimes has nothing to do with geography. The son of "traditional English parents"--his father is a vicar in the Church of England--the Manchester-born Petty was rebellious in his taste for music. Weaned in his youth on healthy doses of The Jam ("They spoke to me with the right amount of angst and eloquence and nice thrashy guitars") and The Smiths. "I was too young for punk," he recalls, "but all the new wave stuff in England--The Buzzcocks and Elvis Costello--was the music that was playing on the radio. They were my first crush bands at the time and they all had big influences on me." The closing track, "Snake Buckle Belt" harks back nostalgically to his childhood ("In the back of a church when I was twelve/I learned to smoke and play cards"), whilst "Mill Smoke Black" finds Petty lamenting "Don't ask where I come from because I come from a past that's gone." "When growing up in East Manchester I yearned to get away. One day I found I'd come a long way away from there." His songs also explore a spiritual yearning for the thing that will finally put the restless heart at ease. For example, there's the elegant and breezy "It Is What It Is," which typifies Petty's quest for spirituality. "The verses are full of anxiety and confusion," he says, "and a struggling to make sense of emotional difficulties. It's kind of an insomnia theme, but the chorus is a blissed out English version of a Zen-like sense of acceptance--sometimes it's good to go 'it's okay, it is what it is.'" Fly Below The Radar may have its aching, personal moments, but the album is not without its uptempo numbers either. The stomping and joyous chorus of "Somebody Down Here Loves You" written by Jordan--who, incidentally, is also the son of a vicar--comes across as an agnostic love song, that "might be seen as nihilistic and anti-religious," co-writer Petty says, with its rejection of religious dogma in favor of a more tangible, earthly love. Elsewhere on Fly Below The Radar, there's the Jordan-penned "Martha," a weeping pedal-steeltinged ballad replete with wistful three-part harmonies. Although it has the emotional feel of a love song, Jordan points out that "it's essentially about a messed-up relationship, between a married couple, based on the play 'Who's Afraid of Virginia Woolf.'" Later, there's also the spare "Badlands," a haunting acoustic homage to Gram Parsons after the band's visit to Parsons' beloved Joshua Tree. Petty recalls, "Tim played the beautiful riff he'd written for hours with Sid, and I wrote the words a few days later. It's a song of yearning for some kind of spiritual peace, whilst being aware of the dangers that lie in searching for it." Yet Fly Below The Radar is not an exercise in sadness. "There's a melancholy there," says Petty. "Things are fragile and fleeting. I appreciate that because the stuff that does work is just fantastic." The album does have its lighter moments. The title track begins with its narrator in a diner with a "mouth full of beans" and "Breathe Easy" recalls a girl who "sends funny letters/Peppered with lines that she stole/She'd plagiarize whole paragraphs." Sharing a mutual admiration with many of its peers, MINIBAR has toured with the likes of The Wallflowers, Old 97's, The Jayhawks and Wilco. They've been joined by Lucinda Williams on stage and count musicians Pete Yorn, Rami Jaffee and Gary Jules as friends. "It's totally surreal and incredibly gratifying," Petty says of keeping such company. Simon Petty is a man who is driven by the relentless search of the past and the quest for what comes next in the future. Although it's a kind of an endless conundrum, Petty has made peace with his almost preternatural wandering: "You can't run away from yourself in the end," he says. Petty is silent for a moment, then adds with a grin, "Plus, when you're in a band, and you're sitting in a van for fifteen hours driving down another road, you really start sorting this stuff out in your head." MINIBAR may have come from England, but they feel comfortable calling California home now. "When you travel, there is a willingness," Petty says, "to allow a difference in place to affect your whole life. A certain amount of it is running away, and a certain amount is hoping for something better."